Physics. an abrupt transition of a system described by quantum mechanics from one of its discrete states to another, as the fall of an electron in an atom to an orbit of lower energy. Any sudden and significant change, advance, or increase. [Origin: 1925–30]. Dictionary.com Unabridged (v 1.1)Based on the Random House Unabridged Dictionary, © Random House, Inc. 2006. You don’t have much…until you get ONE other person to buy into your vision for your business. Until then, your team members don’t have much…but a dead end job. Once you get ONE team member to see where you are going….what’s in it for him (or her, of course) and how can he win…hang on. Your company is about to make a quantum leap. 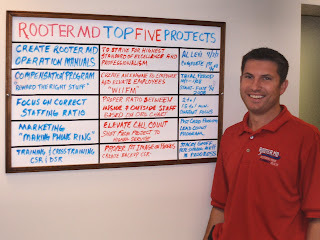 Sharon Allender is the Controller, Matt is the Service Manager…and they are BOTH buying into the opportunities at Rooter MD. Pete Wood is the owner. Hang on, Pete. You are in for a rocket ride. Now, Sharon and Matt are about to drive Pete’s company to new levels. I have the honor of working with Pete, Matt and Sharon, (and the rest of the terrific Rooter MD team) along with my compatriot Al Levi, of Appleseed Business. I just love what I do. 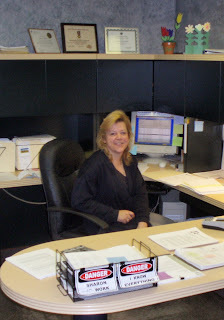 At Bare Bones Biz, our mission is Worldwide Business Literacy. We believe everyone is better off if they know business basics. With Matt and Sharon on board, there is no telling where we will end up. I know one thing for sure…it won’t be a dead end.